The food writers of the East Bay are surely in the midst of penning a half-dozen trend pieces on North Oakland’s recent gourmet renaissance, which seems to span every current food fad: mac ’n’ cheese, beer and sausages, third-wave coffee, and upscale fast-food burgers. Now comes news of yet another exciting food destination on its way: a neighborhood butcher shop and whole-animal-focused restaurant called Clove & Hoof (4001 Broadway), located on the burgeoning stretch of Broadway known, variously, as the Mosswood or Lower Temescal, in the former Temescal Produce Market spot. The project is a collaboration between Analiesa Gosnell, who recently worked as a butcher at Berkeley’s Cafe Rouge, and chef John Blevins, whose résumé includes stints at Gather and Lalime’s (both in Berkeley). According to Gosnell, the butcher shop will sell responsibly raised meat, most of it broken down in-house from whole animals. The restaurant component of the business will primarily focus on lunchtime takeout business, with a small dining room — about 24 seats — for customers who’d like to dine in. Gosnell, who left a career in finance for her current trade, said she’s spent the last couple of years preparing to open a butcher shop of her own. In addition to her brief stint at Cafe Rouge, Gosnell also apprenticed at Fleisher’s, a well-known butcher shop in Kingston, New York. More recently, Gosnell and Blevins spent several months studying butchery and charcuterie in France. 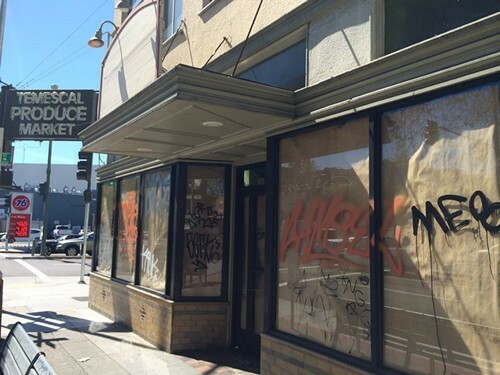 The eventual home of Clove & Hoof, at 4001 Broadway in North Oakland. In terms of inventory, Clove & Hoof will feature the standard butcher-shop selection of meats (beef, pork, lamb, and chicken), and possibly goat, rabbit, and quail as well. Gosnell and Blevins are still figuring out where they’ll source their meat, so they’re not yet sure whether the beef will be 100-percent local or grass-fed. “It’s going to depend on what our neighborhood is demanding,” Gosnell said, adding that the recent drought will make local sourcing more challenging for at least the next year. The butcher shop will also offer a variety of cooking and butchery classes in order to spread “the art of this old tradition a little bit more, too,” Gosnell explained. On the restaurant side, Blevins said Clove & Hoof will showcase “bold, intense flavors” and an eclectic menu that will mostly fall under the wide-ranging umbrella of New American cuisine. Blevins explained that because of the butcher shop’s whole-animal ethos, for many of the sandwich offerings he’ll use inexpensive or difficult-to-use cuts of meat and turbo-charge them with chefly technique and high-end, house-made condiments. For instance, a Middle Eastern-inflected sandwich will feature braised lamb shoulder, curried cauliflower pickles, fried chickpeas, sun-dried tomato pesto, and black-garlic aioli. House-made salumi will also be prominently featured, as will various smoked meats: One of the kitchen’s centerpieces will be a big commercial smoker, and Blevins, who originally hails from Georgia, said he has plenty of experience with Southern-style barbecue. Heartier entrées will include a pork confit stew with garlic sausage (smoked in-house), brisket ends, and Tarbais beans — like a cross between French cassoulet and American pork and beans. Sandwiches will be priced in the $9-to-$10 range, and entrées won’t be too much more than that. Blevins said he doesn’t want anyone to have to spend more than $14 for lunch. Although the restaurant won’t initially be open for dinner, it will offer reheatable packaged dinners to-go. In addition, Gosnell and Blevins plan to host monthly prix-fixe whole-animal-themed dinners, which will feature plenty of good wine and, perhaps, some kind of live butchery demonstration. Gosnell and Blevins still have the entire (quite extensive) build-out ahead of them and are waiting for the go-ahead from the city before they can break ground. Look for an opening date sometime in the fall.